I just got the HCigar VT75 Nano with a Crown 2 and I'm having some trouble getting the settings right for the Crown 2 coil. 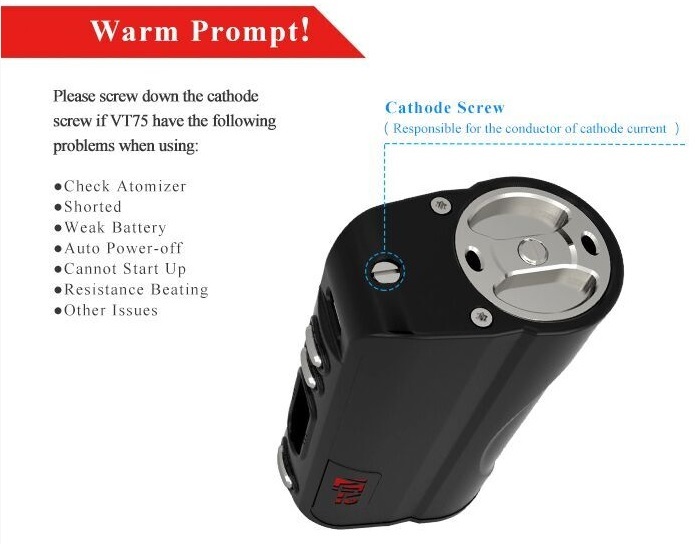 I'm using the .5 Ohm SUS316 coil and with the TC on I keep getting Temperature Protection errors with really weak hits. Does anyone have any advice? Temp protection info messages are not errors, they are nothing to worry about and show the device is working properly, you can turn them off in EScribe if you want. First thing it to check all connections are good and are clean, if that doesn't cure it then I would guess that coils do not match the standard SS316 profile, I don't use a Crown so don't know if there is a better matched material profile for them. In the mean time just turn the temp up until you get the vape feeling right, you will still have temp limiting at a sensible temp, but the temp on the screen may well show higher. New symptom, the ohms value keeps changing. Looked like maybe a defective coil but I popped my original Crown on the HCigar and it's behaving the same way. Everything I can find related to changing ohms values seems to point to the coil but it's happening on two different coils. I haven't used that tank and/or coil, but I've read some reports of folks having trouble with them. That said, how much are the ohms changing by? If you're talking +/- .01 ohms or so, then I wouldn't worry about it. If it's moving a little bit more than that, you could try locking the resistance once you're confident you have a good cold reading. But if it's all over the place, you could have a defective coil. Have you run the atomizer analyzer in escribe? That tool can be helpful in spotting problem coils. It's bouncing from .52 up to as high as .69. As I stated in my follow-up, it's not just one coil. I tried my original Crown tank too and am getting similar results. I'm having a similar problem using 316L, with a DNA 200. But, mine is running too hot, and too high. Very erratic. You might try a rip and reinstall of the software. Even though it is a premade coil, I'd put it on an ohm meter, to see if it is indeed .5. What temperature, and what wattage, is it set at? What temperature, and what wattage, is it set at? 44W with a 450F TC limit. So with ohms locked at .518 (what the atomizer analyzer read), on 44W it's hitting temperature protection about a second into a cold hit. Thus getting a VERY weak hit. Something seems odd. There isn't even enough time for it to heat a coil from room temperature to 450F in a second or two. Did you run the atomizer analyzer? Also, are you sure you have the correct temperature profile .csv loaded? Sorry if this is too basic of a question, just trying to cover the bases. Yes, I ran the analyzer. This is happening with two separate tanks/coils. Both tanks/coils work fine on my old Kanger MOD (although that MOD doesn't have the temp protection). I'm using the SS316 temperature profile. I wish I could try this. The VT75 Nano doesn't have a cathode screw in the same place. I don't see one someplace else on the MOD either. A quick search doesn't come up with anything for a cathode screw on the Nano.